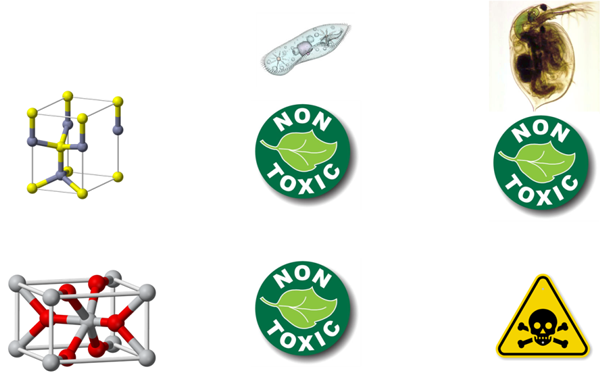 ASDN - Life - Friends or Foes: How Can We Predict Nanoparticles' Toxicity? In recent years, the prefix "nano" gained a great popularity not only for the scientific community, but also in everyday life. The general public meets words "nanoparticle", "nanomaterials" and "nanoscaled" everywhere from the newspapers to advertisements. However, many people have quite a vague idea about what a nanoparticle actually is. So, what is a nanoparticle? 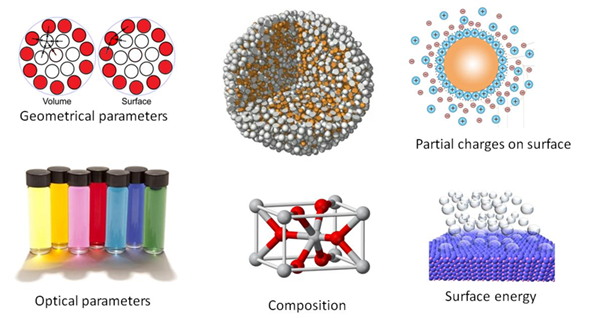 "Nano-" refers to the size of 10-9 m, and by definition, particles of size from 1 to 100 nm are called nanoparticles. The following question arises – what makes the nanoparticles so special? Is it the size itself? The main reason for the drastically different properties of nanoparticles is their surface area. When the size decreases, the surface area increases. And, due to the uncompensated forces influencing atoms on their surface, nanoparticles become much more active than the bulk material. An interesting example is gold nanoparticles. In the bulk state, gold is a yellow soft metal, but the suspension of its nanoparticles possess a cranberry-ish color. As well, the golden nanoparticles have unique catalytic, ferromagnetic, and other properties. Nanoparticles vary, not only in size, but in their shape as well – roughly one can divide them into spherical, cubical, rod-shaped, etc. By their chemical composition, they can be classified as organic and inorganic. 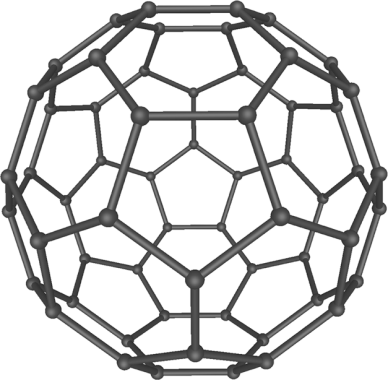 The most well-known organic nanoparticles are fullerenes and carbon nanotubes; the inorganic – nanoparticles of metal oxides, metals, and silica. To regulate stability, solubility, or targeting, nanoparticles can be coated with various molecules. Polymeric coatings are used to ensure high stability of nanoparticles. For biological applications, the nanoparticle can be paired with antibody, drug molecule, or peptide. 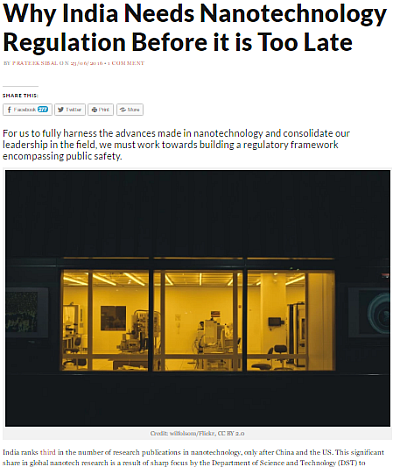 So are the nanoparticles the "lab child" and the distant high-tech future? Certainly, no, as nowadays nanoparticles already have found a wide range of everyday applications. Nanoparticles of titanium oxide and zync oxide are used to scatter light in sunscreens as nanoparticles of titanium oxide play the role of white pigment in cosmetics and food; silica nanoparticles are widely added to the cosmetics as scrubbing particles; and silica oxide nanoparticles provide us with waterproof clothes, and so on. Stunning high-tech technologies based on nanoparticles appear and materialize extremely quickly: flexible and miniaturized electronic circuits, new censors, novel materials, etc. 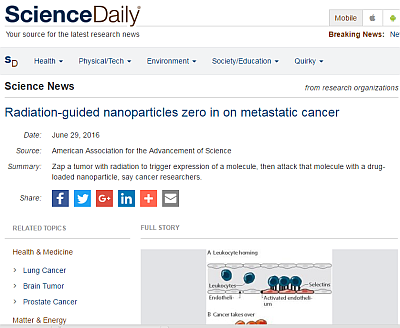 Among the recent research on nanoparticles are biological studies on anticancer agents. In one of the latest articles (DOI: 10.1126/scitranslmed.aaf7374), the authors designed a polysaccharide nanoparticle able to successfully deliver chemotherapeutic agents, targeting the tumor and altogether providing a superior antitumor efficacy. Enforcing this effect with radiation, scientists were able to successfully fight several tumor types. So nanoparticles are friends, aren't they? Unfortunately, nobody's perfect and no nanoparticles are either. Due to their small size and high activity, nanoparticles can possess various toxic effects, not only to humans, but to the environment as well. So, which are putative mechanisms of nanoparticles/ toxicity? Nanoparticles can penetrate the cell membranes and interact with the organelles, i.e. mitochondria, thus damaging their structure and causing disfunctions. Similarly, nanoparticles can damage the DNA and/or cause protein denaturation. These collective factors can consecutively lead to a general cell damage and apoptosis (cell self-destruction). 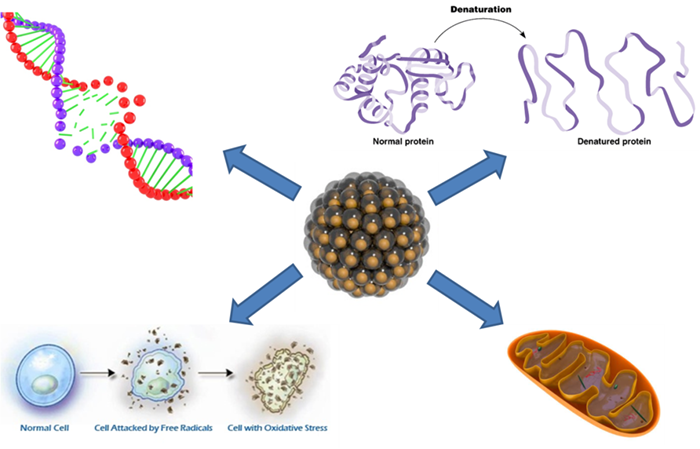 Another mechanism is oxidative stress – when a nanoparticle has a highly active surface and therefore induces formation of free radicals that damage a cell. However, the human toxicity risks are usually quite low – the majority of nanoparticles used in clothing or cosmetic products are too large to penetrate the skin and cause any damage. The environmental toxic effects, therefore, pose much higher risks – even inert nanoparticles (such as silica nanoparticles) can accumulate in living organisms causing their consequential death. 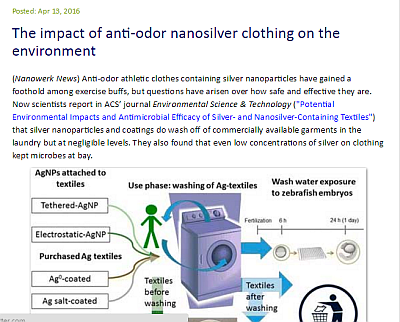 Except the mechanisms listed above, another step ahead when one speaks about environmental influence of metal or metal oxides nanoparticles is that their toxicity is connected with solubility of heavy metal in water, and soluble forms possess a toxic threat themselves. As well, nanoparticles can aggregate inside protozoa causing mechanical damage. The range of affected organisms strikes – algae, protozoa, plankton, bivalves, fish, ... and the list can be continued. So are the nanoparticles too dangerous? Are they foes? Industry and researchers need to be able to predict if a nanoparticle is safe to humans and to the environment. The traditional way to check is to perform an experiment – series of experiments to be precise. Data accumulate over time, and certain empirical laws or models can be obtained. Let us pause for a moment and discuss what an empirical model is. Imagine this situation – you are a Viking. 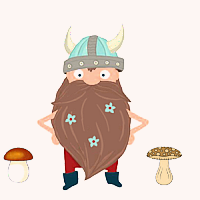 A very absentminded Viking, obviously, as you have been lost in a forest. You feel sad, cold, and utmost hungry. Luckily, you find two mushrooms. The first one has a brown cap with white spots, and the second one has a brown cap without any spots and a thick white leg. While you are standing perplexed, your brain builds an empirical model. It takes parameters or descriptors of a mushroom – color of a cap, spots, shape of a mushroom, thickness of its leg, etc., and it, attempts to find the difference in appearance between edible and inedible ones. After several minutes of the thinking process your brain advises you to eat the second mushroom, and it’s certainly right! The first one was amanita – one of the most poisonous mushrooms. Thus, the more data we collect, the more robust models we can obtain. But empirical models can be tricky. 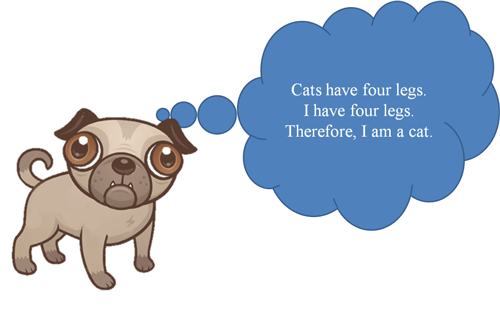 A famous joke portrays a dog tricked by its own empirical modeling into thinking itself to be a cat. So, is it always possible to uncover all the hidden trends just by observing the data? What can humans do when data is too complex to describe it just by looking at it? What if the data is too disorganized? Then researchers can employ computer modeling, and the modern methods of machine learning. Machine learning is an area of modern mathematics, statistics, and computer science that provides a powerful method to describe and predict various dependences. Some of them – such as neural networks – aim to simulate the work of the human brain; the others have funny names – such as random forest, but all of them can work with huge amounts of data too complex for a human brain. In the field of chemistry, called chemoinformatics, the whole area – called QSAR/QSPR (Quantitative Structure-Activity/Property Relationships) employs machine learning methods to describe chemical and physical properties of compounds and predict these properties for new unstudied compounds. To build any statistical model means to find some sort of relationship between X and Y, where Y is the property that we want to study and X – the dependent variables. Y can be of two types, which are either a continuous variable or a classification variable. Continuous variables provide an exact numerical response, for example, 7.45. Whereas classification variables simply label a data point according to a desired property, i.e. “toxic” or “non-toxic”. Dependent variables are used to characterize a data point (studied object) itself. In the case of a mushroom, each can name simple and informative characteristics, but what about a nanoparticle? Imagine a nanoparticle being a small yellow ball. What can be said about it? One will certainly say "spherical", "yellow", "rubber", and whatever else to describe the ball. The same set of parameters can actually be used to describe a nanoparticle. "Spherical" will then refer to the geometrical parameters (shape, volume, surface area, etc. ); "yellow" – to the optical properties; "rubber" – to the chemical composition (which includes description of nanoparticle's coating). The other parameters are partial charges on the surface, surface energy of nanoparticles, characteristics of the compounds in the nanoparticle and so on and so forth. As well, a range of physical theories exists – such as Liquid-Drop Model or Surface-Area-Difference theory – that allow to calculate geometrical and energetic parameters for nanoparticles using predefined atomic values. Altogether, these calculated parameters are X for the machine learning model. Another term for them, frequently used in chemoinformatics for the compounds' parameters, is "descriptors". And now we can use the descriptors for the nanoparticle and develop a statistical model for nanoparticles or a Nano-QSAR model. The titanium dioxide happens to be toxic at a given concentration towards Daphnia magna! Further, we can analyze the model, and we discover that the main influencing factor is the charges on the nanoparticles' surface! This can lead to oxidative stress, to which Daphnia magna are extremely sensitive. In such a way, the model not only helps us to obtain new data and shorten laborious experimental studies, but also to uncover new dependencies. To summarize it all, this is just the tip of the iceberg. 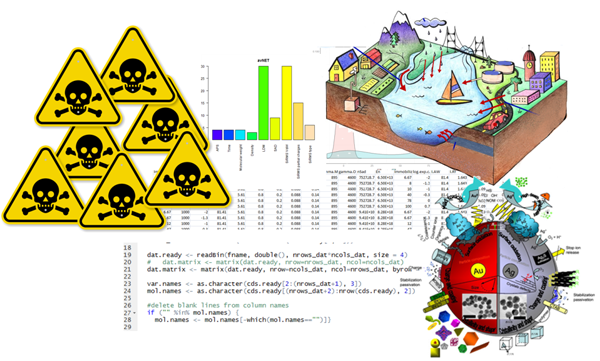 The multiple types of toxicity exist, the experimental data frequently happens hard to unify, and not all environmental pathways are studied. However, the main conclusion is that nanoparticles are neither friends, nor foes. As with any scientific discovery, they should be treated carefully and studied extensively. And Nano-QSAR is one of the useful tools to do it. Mokshina Elena – Researcher from Department on Chemical Structure and Chemoinformatics, A.V. Bogatsky Phys.-Chem. Institute NAS of Ukraine, Odessa, Ukraine. Kuz’min Victor – Head of Department on Chemical Structure and Chemoinformatics, A.V. Bogatsky Phys.-Chem. Institute NAS of Ukraine, Odessa, Ukraine. 1. News about nanoparticles world. 3. Introduction to QSAR in general and Nano-QSAR in particular. 4. Puzyn, T., Rasulev, B., Gajewicz, A., Hu, X., Dasari, T. P., Michalkova, A., ... & Leszczynski, J. (2011). Using nano-QSAR to predict the cytotoxicity of metal oxide nanoparticles. Nature nanotechnology, 6(3), 175-178. 5. Sizochenko, N., Rasulev, B., Gajewicz, A., Mokshyna, E., Kuz'min, V. E., Leszczynski, J., & Puzyn, T. (2015). Causal inference methods to assist in mechanistic interpretation of classification nano-SAR models. RSC Advances,5(95), 77739-77745.